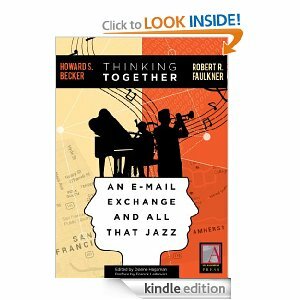 Howard Becker and Rob Faulkner have published an ebook “Thinking Together” in which they use their long-standing email debate to reflect on the problem of cooperation, both amongst jazz musicians and academic researchers. The book is currently being discussed over on Org Theory. Maybe somebody here has read the book and wants to comment either on Org Theory or here. Or maybe review the book for the journal? This entry was posted in Book, Interactionism and tagged Becker, cooperation, music, research. Bookmark the permalink. The book on improvisation was wonderfully thought-provoking. Now I can’t wait to find this one & read it!